The Lokrock unit at only 2.5kg allows you to easily create garden edging in virtually any shape you want with only one type of unit. 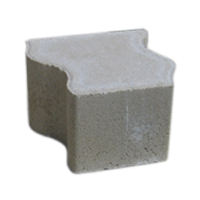 Lokrock is generally used to divide garden beds from lawn areas, create circle features, create borders and micro-walls. The block design allows adjacent blocks to interlock in both the forward and back dimensions to help prevent units from dislodging.